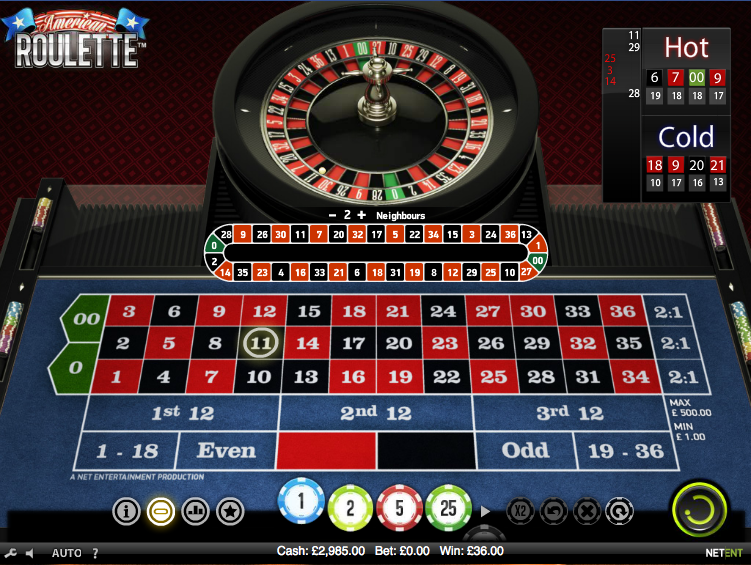 If you’re looking for some laid back tunes and an opportunity to experience a casino atmosphere from the comfort of your own home then perhaps it’s time to check out one of the many roulette varieties available at our recommended casinos. This is Net Entertainment’s American Roulette and if you’ve played their French Roulette then you’ll pretty much know the score already. For those who haven’t, read on to find out more. American Roulette does of course differ from French Roulette because it contains an extra double zero, theoretically reducing your chances of winning slightly. The heel is split into 38 segments rather than 37 so bear that in mind when choosing your roulette variant. Load up the game and you are shown a screen with the betting table at the bottom and a slowly rotating wheel above it. On the right of the wheel the ‘Hot’ and ‘Cold’ numbers are listed and this shows the most frequently occurring results. Statistically this has no bearing on any future results but you can place a bet on all the Hot or Cold numbers by clicking either title. Get the standard betting underway by choosing a chip size between £1.00 and £500.00 (the maximum bet size is £10,000). You can bet on single numbers, two numbers at once, odds/evens, red/black, etc – the choice is yours. For more complex bets you can click the ‘Open Racetrack’ button to the left of the chips which will open the racetrack. Here you can pick a number and automatically bet on the two numbers either side of it for a total of five. Note that unlike the French version, there aren’t any more complex ‘neighbour’ bets so things are a little simpler. When you’ve finished betting just click the green button in the bottom right hand corner to start the ball moving. Now watch in hope that it will land on one of your numbers. You can now repeat your bets or start over if you fancy a different strategy. This is a perfectly good game of roulette but we’re inclined to play the European versions just because the RTP is better value for the player. It’s 94.74% here while the the single zero version is 97.30%.